Dermatologically approved. 0% fragrance, 0% dyes, 0% acids and 0% enzymes. British Allergy Foundation - Allergy UK Seal of Approval. LPB - Loved By Parents Winner Gold 2016. This product has not been tested on animals by or on behalf of Robert McBride.With nothing in to irritate skin* *We promise not to put anything unnecessary into our laundry powder that may irritate your skin. No enzymes, no dyes, no acids. None of the stuff that other laundry powder seem to think is okay. Not even fragrances. Even if they're the nicest smelling scent in the world. Because in our view nothing smells as good as the 'just-off-the-line' smell of fresh air. And we know that anything we put in that's not absolutely necessary to get your laundry clean risks irritating your skin. So, as the champions of sensitive skin, we promise: nothing unnecessary, and outstandingly clean laundry each and every time you wash. Direction for use Using the measuring cap provided, pour the liquid into the dispenser of your machine. Rinse cap after use. For best results use in the washing machine drawer. Always follow garment manufacturer's washing instructions. For problem stains pour the liquid directly onto the stain and wash immediately. See pack for full dosage instructions. 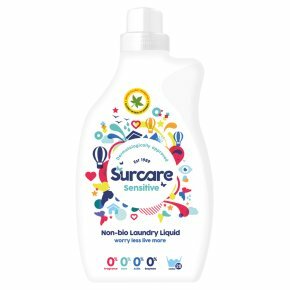 DANGER<br>Surcare non bio laundry liquid<br>Contains MEA-DODECYLBENZENESULFONATE. Contains C13-15 PARETH-8. Causes serious eye damage. If medical advice is needed, have product container or label at hand. Keep out of reach of children. Read label before use. Wear eye protection. IF IN EYES: Rinse cautiously with water for several minutes. Remove contact lenses, if present and easy to do. Continue rinsing. Immediately call a PIOSON CENTER or doctor/physician.<br><br>Do not wash flame resistant fabrics above 50�C. Always wash dark fabrics separately. Not recommended for wool or silk. Always check colour fastness on an inside seam before pre-treating stains with neat liquid.<br><br>Please note that no effective laundry liquid can be guaranteed suitable for people with serious skin conditions. If you suffer from unusually sensitive skin, please contact your doctor for advice.